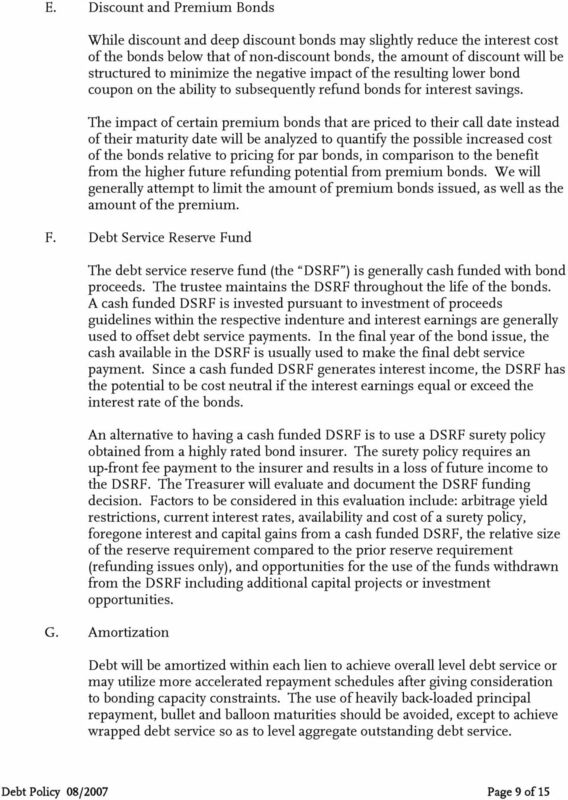 Download "Debt Policy. Summary of Policy. 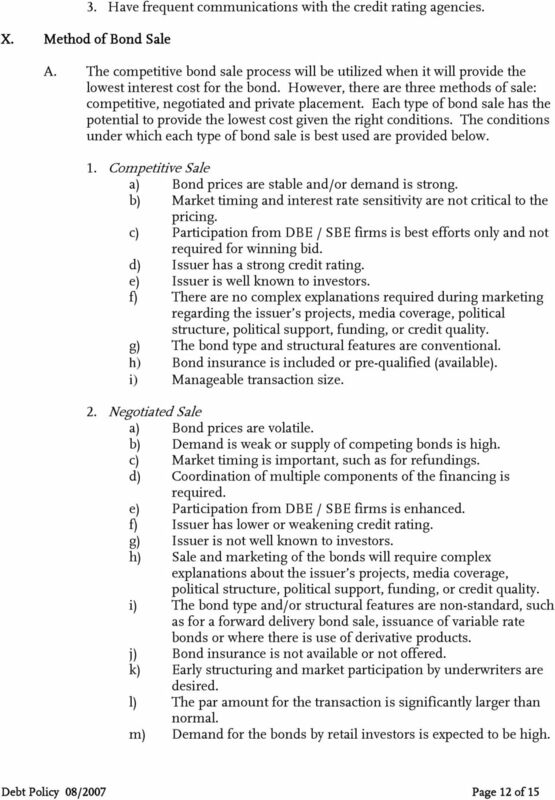 Historical Perspective"
1 Debt Policy Summary of Policy The Debt Policy governs the issuance and management of all debt, including the investment of bond and lease proceeds not otherwise covered by the Investment Policy. The process for selection of debt and lease related investments, financial products and professional services are specified in the policy. 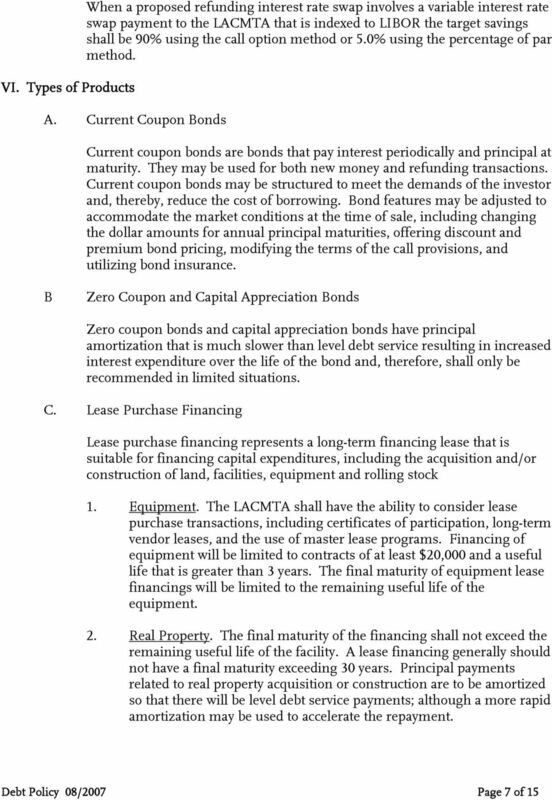 The Debt Policy also governs all tax-exempt and taxable leases funded by the capital markets, by major financial institutions, or through private placement, other than those covered in the Defeased Lease Policy. 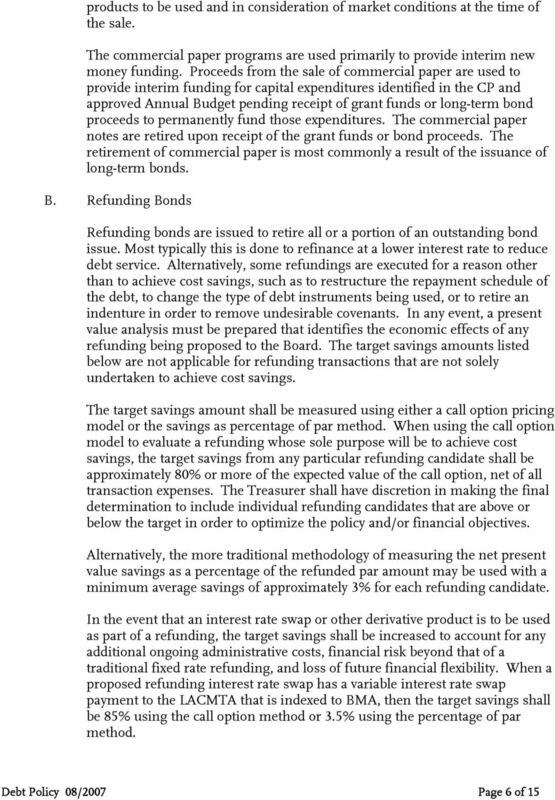 The goals of the Debt Policy are to achieve the lowest possible cost of capital subject to prudent risk parameters while preserving future financial flexibility. 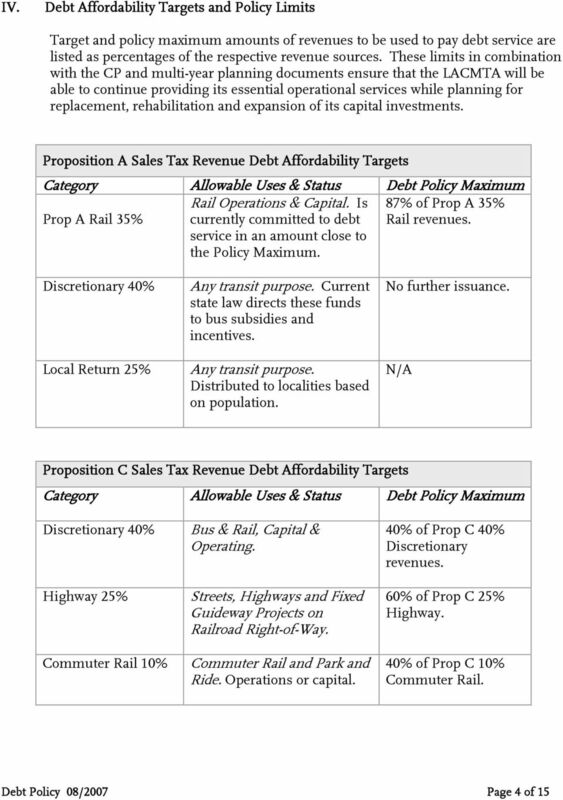 Our policy is unique because it provides debt affordability targets by revenue sources. 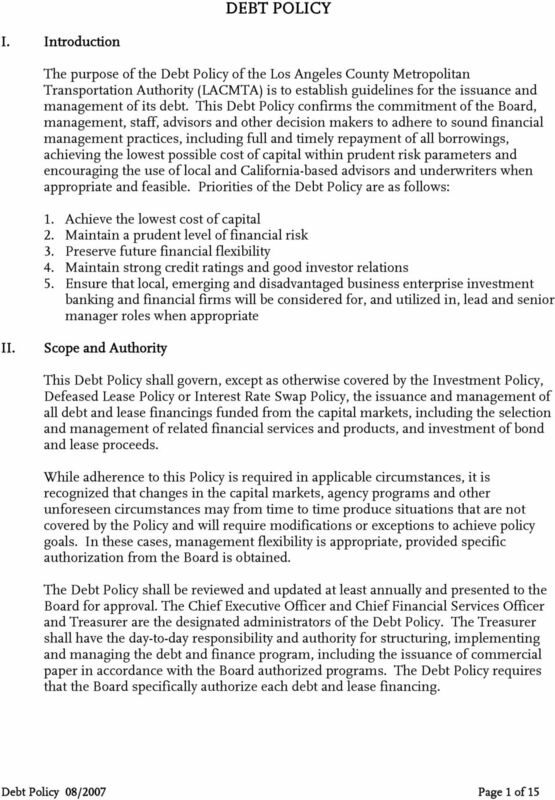 This Debt Policy confirms the commitment of the Board, management staff, advisors and other decision makers to adhere to sound financial management practices, including full and timely repayment of all borrowings, achieving the lowest possible cost of capital within prudent risk parameters and encouraging full use of local and California-based advisors and underwriters when appropriate and feasible. 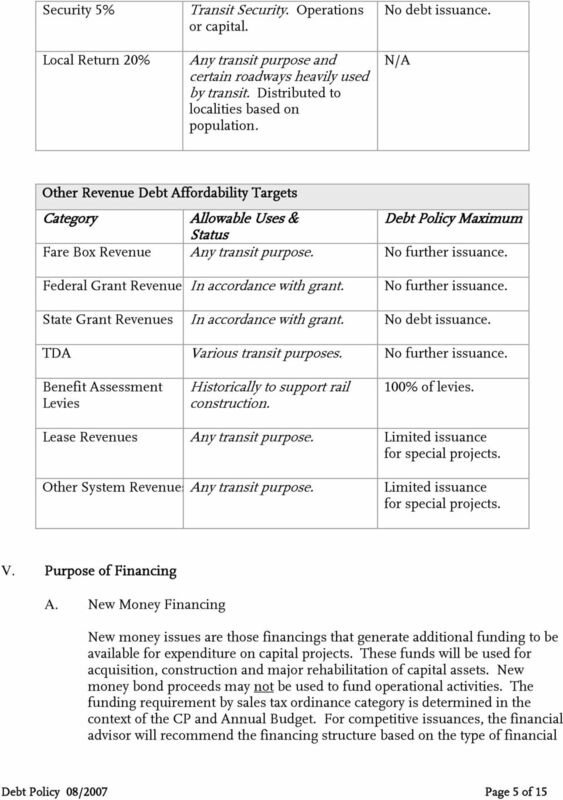 Priorities of the Debt Policy are as follows: 1. Achieve the lowest cost of capital 2. 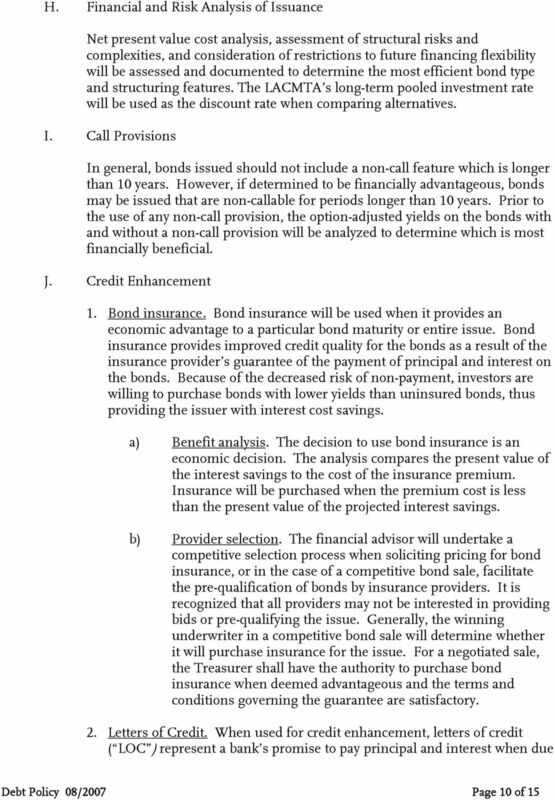 Maintain a prudent level of financial risk 3. 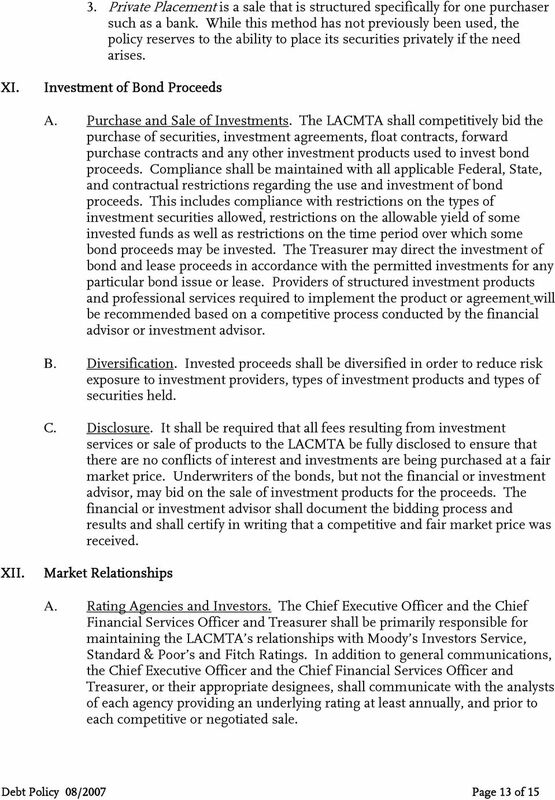 Preserve future financial flexibility 4. Maintain strong credit ratings and good investor relations The Debt Policy and Interest Rate Swap Policy work together to assist in achieving the lowest possible cost of capital, subject to prudent risk parameters, and while preserving future financial flexibility, as well as in effectively managing currently outstanding obligations. The Debt Policy and Interest Rate Swap Policy respectively establish appropriate practices regarding the issuance and management of debt and interest rate swaps. 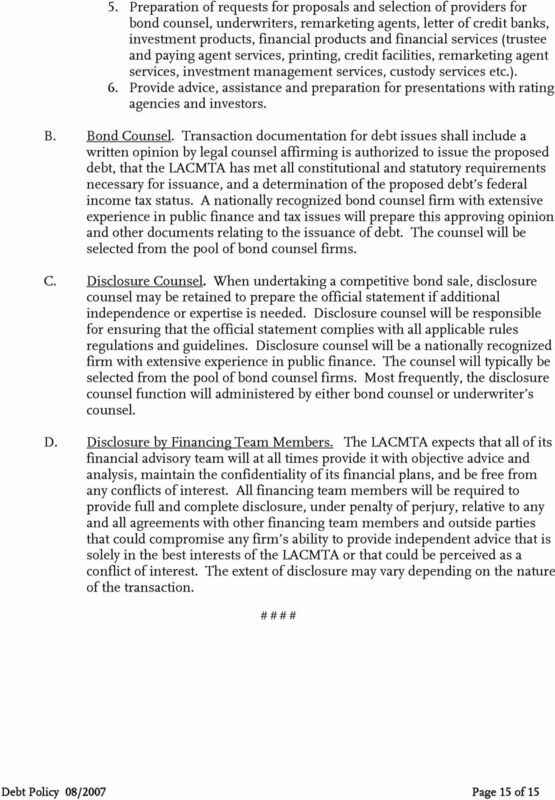 Guidance is provided specifying appropriate uses, selection of acceptable debt and lease products; swap providers, negotiation of favorable terms and conditions, and stipulating annual surveillance of the swaps and the providers. 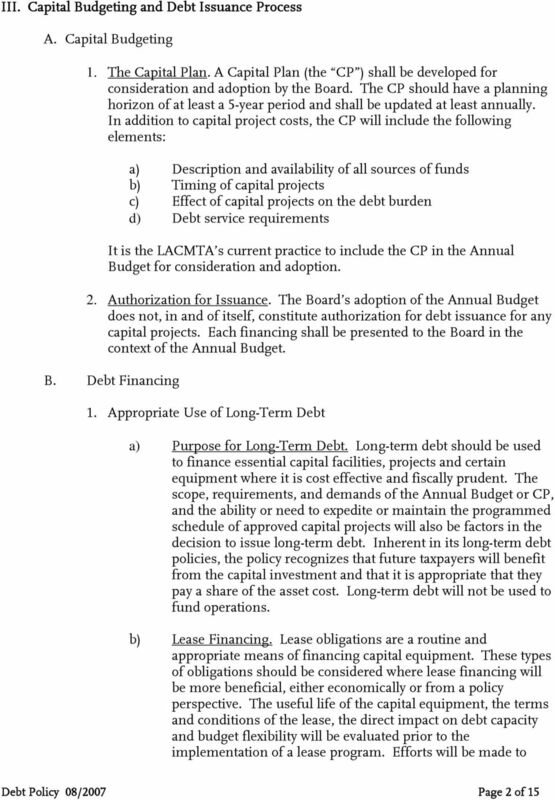 The Debt Policy is reviewed annually, updated and brought before the Board for approval. 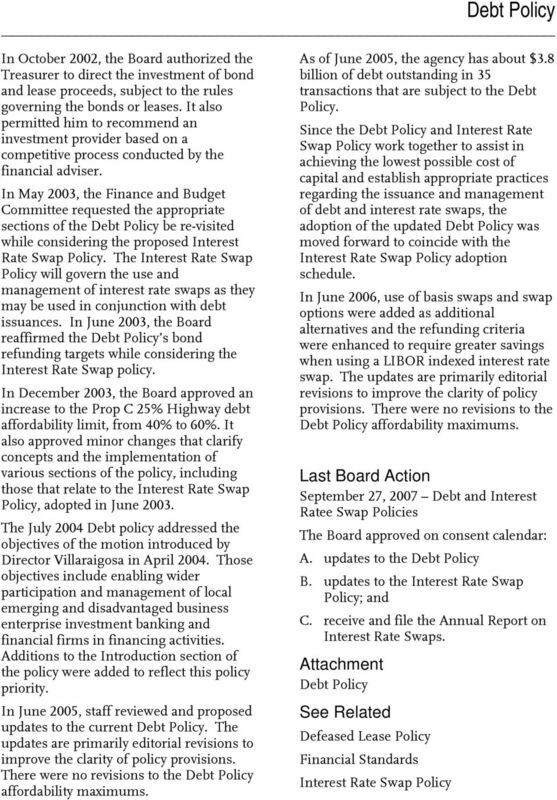 In September 2007, staff reviewed and proposed updates to the current policy. The updates are primarily editorial revisions in order to improve the clarity of policy provisions. 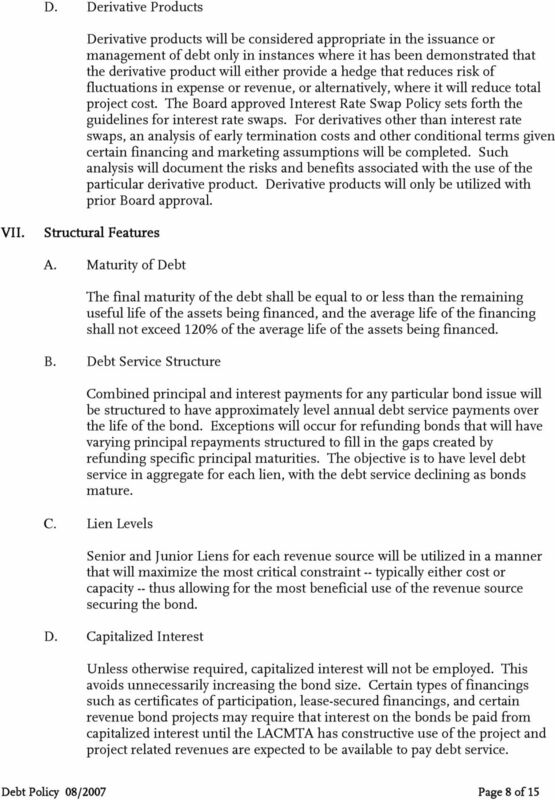 As of September 2007, the agency has about $3.6 billion of debt outstanding in 33 transactions that are subject to the Debt Policy. 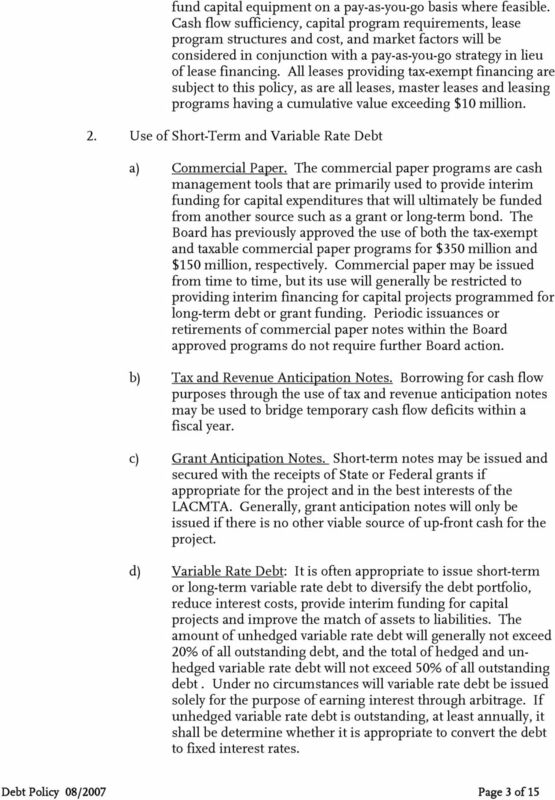 Historical Perspective In June 1998 the Board required all taxexempt commercial paper issuances to be brought before the Board until a debt policy was in place. 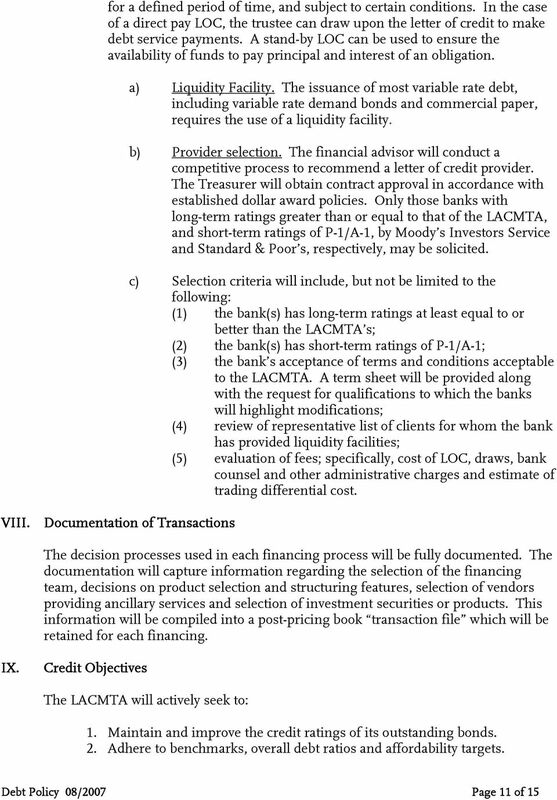 Previously, there was no formal debt policy; debt was issued in accordance with needs and industry practice. 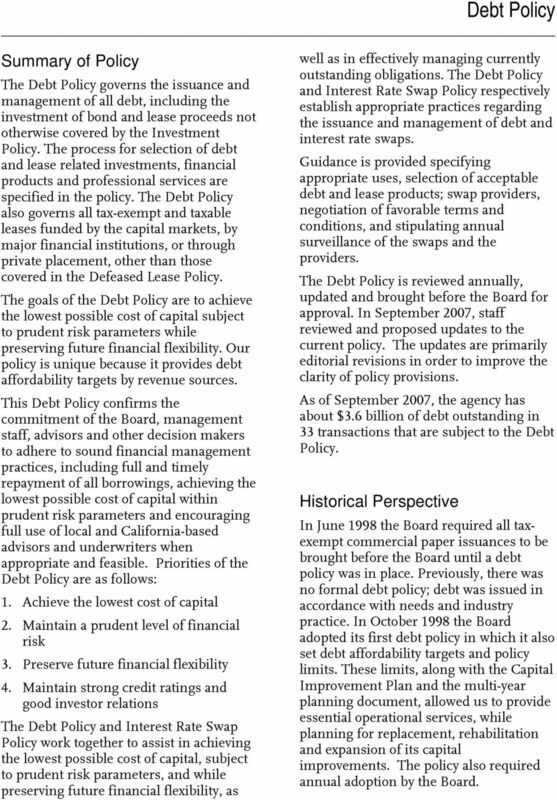 In October 1998 the Board adopted its first debt policy in which it also set debt affordability targets and policy limits. These limits, along with the Capital Improvement Plan and the multi-year planning document, allowed us to provide essential operational services, while planning for replacement, rehabilitation and expansion of its capital improvements. 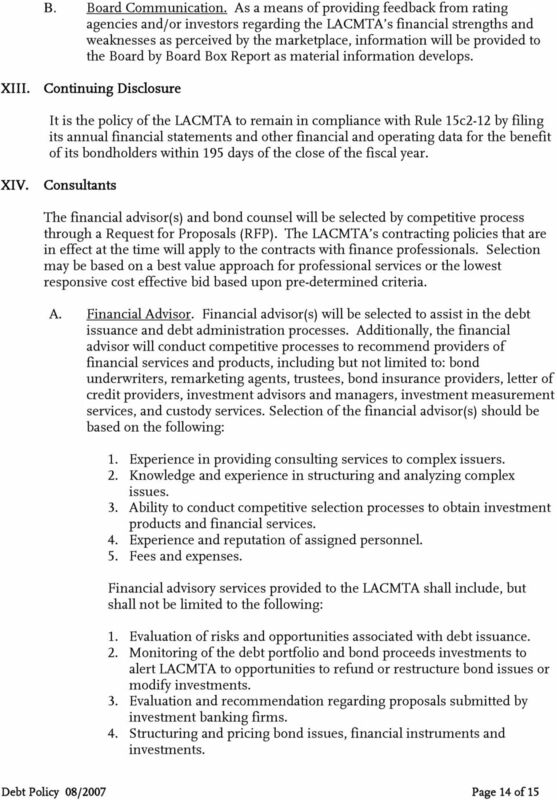 The policy also required annual adoption by the Board.